I have never had a green thumb. If something grows in the ground, I can usually find a way to kill it. I cannot grow a tomato to save my life and my spinach plants sprouted like they were going to do something and then got a glimpse of their gardener and curled up and died. So the only explanation I have for the beautiful kale I grew this year is that the stuff cannot be murdered. Seriously, if I can grow kale, anyone can grow kale. The problem is, I grew gorgeous kale and then had absolutely no idea what to do with it. I mean, I want to add kale to my repertoire, but it isn't something that comes naturally for me. I can't remember ever having kale as a child and I can barely get my own kids to eat turnip greens, so kale has been a bit of a challenge. I think it is quite ironic that the most successful plant I grew in my garden this year was the one I knew the least about. I've tried making kale chips, which did not meet with much enthusiasm from my family at all. While I kept searching for kale recipes to try, my kale kept growing, getting bigger, curlier and greener, taunting me make something with it. So, I was quite interested when I happened to see Ina Garten on her show making a winter slaw with kale. 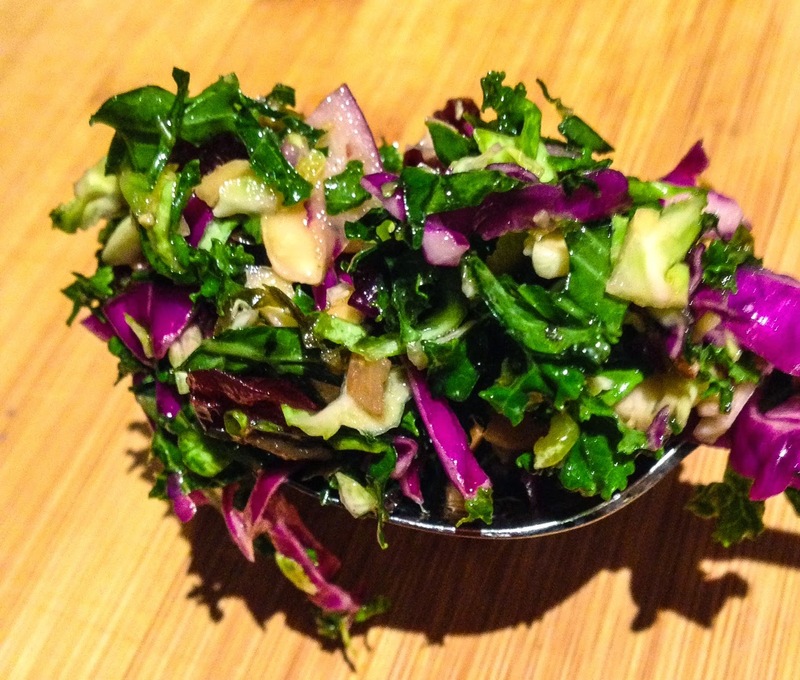 Ina used kale, radicchio, and Brussels sprouts, finely chopped and topped with a lemony vinaigrette. I decided to try a kale slaw for myself, but I needed to make a few changes from Ina's recipe. First, I am not a fan of radicchio, so I traded it for some purple cabbage. Taking Ina's advice, I finely shredded the kale, cabbage and the Brussels sprouts. The purple cabbage and the dark green kale were absolutely beautiful together. Also, my family thought the lemony vinaigrette was a little tart for their tastes, so I made some changes to the dressing. I chose to eliminate the parmesan cheese that Ina added to her slaw. Additionally, Ina's recipe called for dried cranberries, which I used, but I thought it could use something nutty. 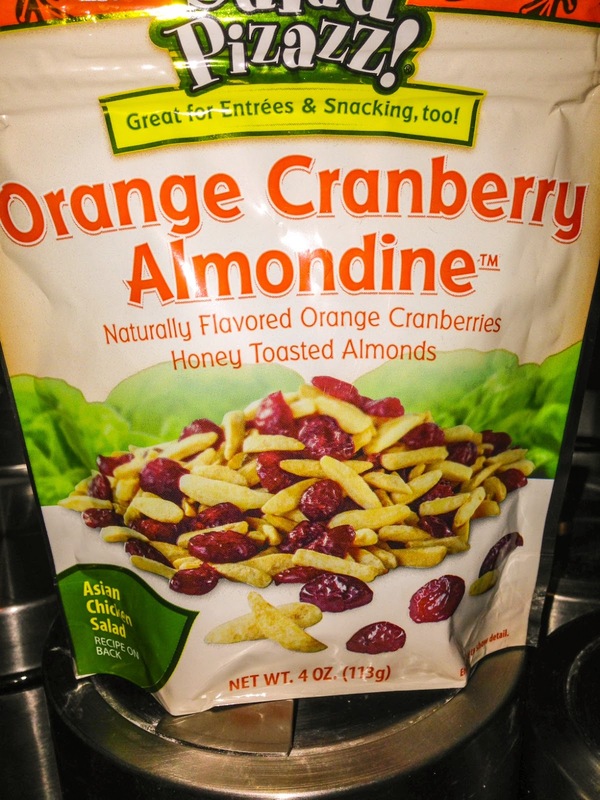 I just happened to have a bag of sweetened, orange flavored almonds and cranberries that my friend Merri introduced me to when we went to the beach last year. Merri is one of the best cooks I know and she has lots of good food ideas. She told me she often adds these flavorful almonds and cranberries to her salads. After one taste, I was hooked, so I keep a bag of them in my pantry at all times. I thought the orange flavor would be a great addition to the kale. Here is what I ended up with. 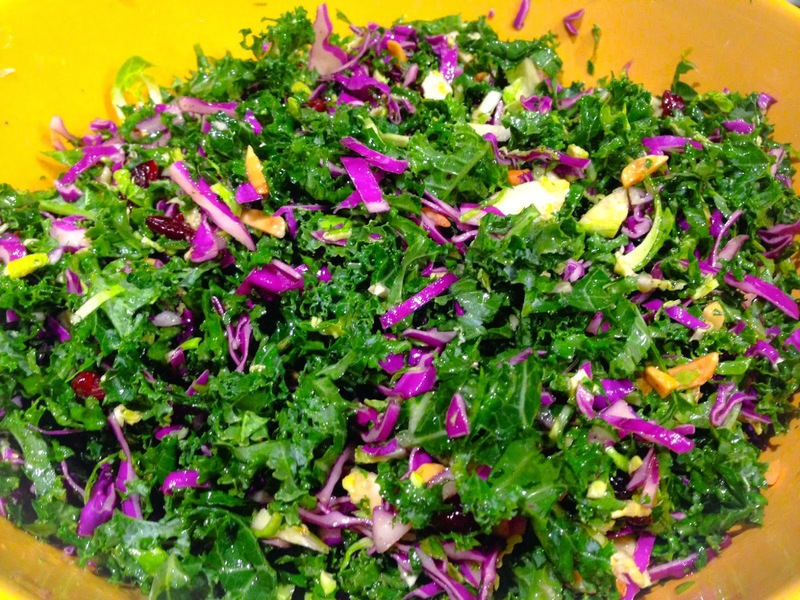 A sweeter version of Ina's kale slaw. I just love the purple and green together. Just looking at this pretty slaw makes me happy. I am also thrilled to be actually using my beautiful kale in a dish. Here's the recipe. Be forewarned...it makes a huge bowl of slaw. See what you think! 8 Brussels sprouts, with the stems trimmed and cored. Finely shred cabbage, kale and Brussels sprouts and put in large bowl. Add the orange cranberry almondine and dried cranberries to the shredded vegetables. In a separate bowl whisk together remaining ingredients and pour over the slaw.